I’ve been skimming through Silvia Tolisano’s series on student blogging. I emphasise “skimming” because she may have addressed the issues I raise below without my being aware of it. She places much store by a rubric developed by Clarence Fisher for the purpose of evaluating students’ blogging efforts. Yeah, right! Photo is (c) Robert Lennon http://www.flickr.com/photos/digitalrob70/On the face of it, this is a good idea. A rubric has the advantage of showing rather than telling. By way of analogy, if you wanted to tell someone what a chicken looks like you could either relate a list of all its attributes, or you could show them a photo of a chicken. The latter is so much easier. On the other hand, there is almost always a degree of subjectivity. In this case, for instance, what is the difference between a blog that is “written in a somewhat interesting style and voice” and one that is “written in an interesting style and voice”. And how long would it take to evaluate a whole class-full of student blogs if for each one you have to not only read the blog but judge it against 16 criteria? First, it fails to address the “so what?” question. 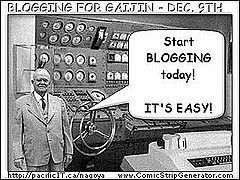 What is the purpose of the blog? Other criteria have to relate to this directly. For example, do the illustrations used further the blog’s purpose? As an adjunct to this, even if the blog’s purpose is clear, is there actually any point to the blog? I mean, many (student) blogs seem to exist simply to relate the minutiae of the writer’s life: why should I be interested? I realise that that sounds rather crass, but let me put it this way. A few years ago I picked up an article that purported to be a review of the BETT show. In fact, two thirds of it were about the writer’s journey to the BETT show. What made him think anyone else cared? Second, the rubric implies that the more multimedia there is, the better. But, as stated above, any multimedia should serve the blog’s purpose or enhance it in some way. The enhancement aspect is covered, but in the context of multiple pieces of multimedia. What if the student had selected the “perfect” illustration? How would adding more add to the quality of the blog? Sometimes – in fact, often – less is more. Third, the rubric contains criteria related to how interesting the style and voice are. But what about a very simple, and yes, highly subjective, criterion: how enjoyable was it to read? Writing is meant to be read, and it can be interesting and well-illustrated, but if it’s not actually enjoyable to read, who will want to read it? Fourth, is it good enough to have been published and paid for? I think this is perhaps controversial, but if a magazine editor could see themselves paying the writer for publishing the blog post then it surely means it must have some merit? That leads me on nicely to my final point: are teachers the right people to evaluate students’ blogs anyway? Or should they be the only people to evaluate them? Perhaps a friendly professional writer or editor could be drafted in occasionally to give their opinions?